Moonfall is a book I wrote in honor of Halloween! You can find it most anywhere on line in paper or e-format, or order it from your favorite bookstore. The first book I want to talk about is by one of my favorite authors, Tamara Thorne. I was first introduced to Tamara through an interview on horrorworld.org. In the interview, Tamara mentioned that for easter she was planning on painting some mice to look like Easter eggs, so her cats could enjoy the holiday also. I liked her sense of humor and ran out and bought her book Moonfall. 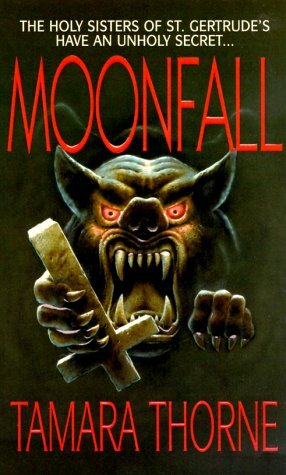 Moonfall was written in 1996 and is centered around Sara Hawthorne and John Lawson. The Cliffside Lodge has a history dating back to 1887. Not only has it been a place to stay for people enjoying the beauty of Blue Lady Lake, but it was also a place with a dark history. In the twenties a serial killer called the Bodice Ripper terrorized the town and a ghost called The Blue Lady was seen when a death was about to occur. Flash forward to the present and a new serial killer is terrorizing the town and the Blue Lady is making her presence known again. 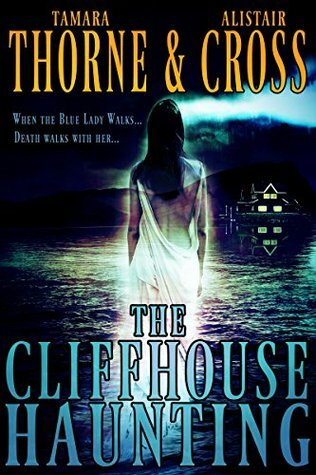 At the Cliffside Lodge, wet foot prints are being spotted in rooms, disembodied voices are being heard and when people look in the mirror they see the face of the Blue Lady. Next week… The Ghosts of Ravencrest novel! In his short story, The Lake, Ray Bradbury described the day after Labor Day, the start of the fall season, so perfectly that it left an indelible impression – lonely, frightening, and perfect – on my eight-year-old brain. Thanks to the Master’s tale, I look forward each year to the day after Labor Day because, even in southern California, I begin to see, smell, hear and feel those autumnal signs. The school bus is an early portent of fall as it wheezes and farts and carries its prisoners back to school, thereby silencing neighborhood shrieks, calming grocery stores, and making it possible for me to sneak off to a peaceful weekday matinee. That’s nice, but… There’s so much more. So very much. A few days ago, just before another heat wave struck, I walked outside and there, riding an unusually cool morning breeze, I smelled autumn for the first time this year. The scent of leaves beginning to dry and wither on trees? Perhaps. I have yet to smell it again, but I know I will, and soon. It will happen more and more often until Halloween is a breath away, and then autumn will settle in for good, giving us our most beautiful and nostalgic season of the year as the leaves of liquidambar trees, here near the mountains, turn brilliant shades of fiery orange, shining gold, and deep purplish blood. And so they will stay, slowly falling, scuttling through the neighborhood on crisp evening breezes, racing down streets and hiding behind the wheels of parked cars. This will continue until Christmas draws near and winter takes the last of the leaves. 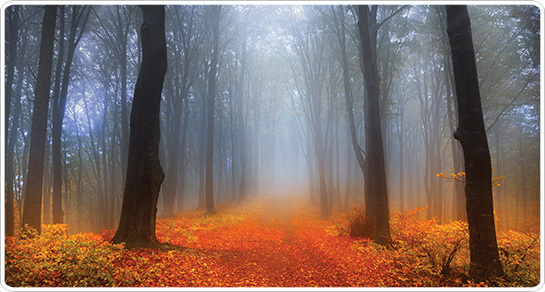 The same morning I smelled autumn, I saw it in the slant of the sunlight, as well. Conditions were just right – I haven’t seen it again, not yet, but I will, and soon. I look for it each morning. We are in a spate of steamy dog days now, but in a month’s time there will be the occasional scent of woodsmoke on cool nights, and then, the smell of burnt pumpkin on that most wonderful night of all. Halloween has always been my favorite holiday. It’s the season of ghost stories and campfires, toasting marshmallows and warming your hands over the fire and a ghostly breeze tickling goosebumps up on he back of your neck. I love to write about Halloween and more than a decade ago, I set one of my Halloween-centric novels in a place called Moonfall, which is not-so-loosely based on a real apple-growing community in SoCal called Oak Glen. I opened the book with our hero, future sheriff John Lawson, as a child attending the big festival at one of the orchards. The real Moonfall, Oak Glen, has held Halloween celebrations with hayrides and treats for costumed kids, but in my version, the Moonfall the festival is the grand celebration I’ve always longed for. 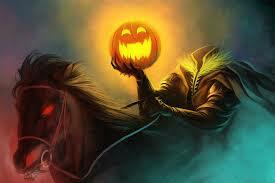 It features the Headless Horseman from The Legend of Sleepy Hollow riding through an apple orchard as a portent of things to come. And now, coincidentally, one of the orchards, Riley’s Farm is presenting The Legend of Sleepy Hollow throughout September and October with a promise that the Headless Horseman himself will be riding by. How fun is that? While the real Oak Glen doesn’t have a squad of evil nuns running a haunted girls’ school and baking mince meat pies with questionable ingredients, this year, I’d love to go bask in all that Halloween goodness and pretend I’m a kid in Moonfall watching the Headless Horseman ride screaming through the orchards while I sip hot cider and smell burnt pumpkin and woodsmoke in the air. And hear the screams. Lots and lots of screams as the ghosts of Moonfall – and Oak Glen – come out to play.